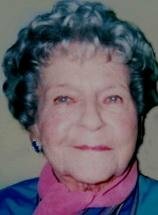 WATERLOO - Margarite N. Bowers, 95, of Waterloo, died at her home Thursday, Nov. 26. She was born April 11, 1914, in Independence, daughter of Edson and Ella Butters Brimmer. She married James Abraham "Bud" Bowers on Aug. 15, 1936, at the Little Brown Church, Nashua. He died June 14, 2003. Mrs. Bowers was a homemaker and a care giver for multiple family members, especially nieces, nephews and friends. Survived by: a daughter, Rebecca Bowers of Waterloo; two grandchildren, Eric N. and Natasha Walker, both of Waterloo; three great-grandchildren, Naomi, Elijah and Grace; and a brother, Junior Brimmer of Waterloo. Preceded in death by: her parents; four brothers, Willard, Clifford, Gilbert and George Brimmer; and a sister, Edith Elliott. Memorial services: later this week, with inurnment in Garden of Memories Cemetery at a later date. Friends may contact the family at 235-1152. The Kearns, Huisman-Schumacher Chapel is in charge of the arrangements. Margarite loved the outdoors and her home. We will miss you - we are confident you are at peace and resting in the Lord God.